Loudoun County Attorneys > Our Firm > J. Caleb Jones, Esq. 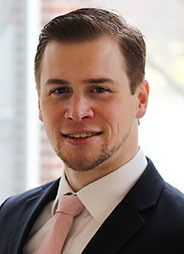 Johnathan “Caleb” Jones joined the firm as “of counsel” in January of 2019. Mr. Jones represents clients in primarily civil and commercial litigation matters. Mr. Jones gained significant experience in complex civil litigation at Crowley, Hoge, & Fein, P.C, in Washington, D.C. There, he played a significant role assisting with legal malpractice cases, including drafting court motions, communicating with clients, and attending court for motions hearings. . He also has significant experience as an attorney enforcing judgments, negotiating foreclosure matters among secured parties, and handling litigation and transactional matters with small-business corporate clients. Mr. Jones also acts as a Co-Director of the Good Samaritan Advocates legal aid clinic at Columbia Baptist Church in Falls Church, Virginia, providing pro-bono legal assistance to those in financial need. During his time as a law student, he was a winner of the Alvina Moot Court competition, a tournament award-winning member of the Moot Court Honors society, and the recipient of the “highest grade” distinction in his Civil Litigation class at American University, Washington College of Law. His first internship experience was with the Office of the Clerk in the Federal District Court of Maryland at Greenbelt, giving him a first-hand perspective of the entire process of complex litigation. He currently lives in Alexandria with his wife, is a member of Redeemer Church of Arlington, and assists with all aspects of litigation at Simms Showers, LLP.